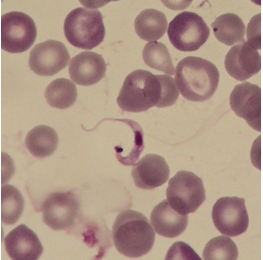 The pathogen: The unicellular protozoan Trypanosoma cruzi, surrounded by red blood cells. Source: Division of Infectious Diseases and Tropical Medicine, LMU Medical Center. Chagas disease is endemic to more than 20 countries in Latin America, of which Bolivia is by far the most seriously affected. In the study, the Munich researchers interviewed and examined 43 individuals with Bolivian roots, most of whom have resided in Germany for years, and approximately half of whom were born here. Four of these persons (9.3%) were found to be infected with T. cruzi. This rate of infection is lower than that recorded in comparable studies of Bolivian migrants elsewhere in Europe, e.g. in Spain, but the authors point out that the sample size is not large enough to be representative. Nevertheless, the researchers view the prevalence of infection among the study population as “alarming,” not least because monitoring and treatment of the disease pose a considerable challenge to the German healthcare system, which they believe it is inadequately prepared to meet.